Here follows a breakdown of how the components are manufactured to produce the elements required for T3 production and invention. Polymers are made in the Polymer Reactor Array which can only be anchored using a POS in 0.3 space and below (and may be run in wormhole space). A polymer reaction requires a Polymer reaction which are seeded on the NPC market under Manufacture & Research / Reactions / Polymer Reactions, 2 of the 9 different types of fullerene gas and a normal mineable mineral. To make this we require 1,000 units of Tritanium per cycle (per hour), 200 units of Fullerite-C50 gas per cycle and 100 units of Fullerite-C60 gas per cycle. 1 Silo [500 CPU 50,000 MW] - for Tritanium. The total CPU and power needed for the above reaction is 2,750 CPU and 325,000 MW, so a large control tower is recommended. Reverse engineering provides Tech 3 blueprint copies of the strategic cruiser hulls and the various subsystem modules it requires. There are six different types of relic and each one corresponds to a different piece of the Tech 3 ship - the hull, defensive subsystem, electronics subsystem, engineering subsystem, propulsion subsystem and offensive subsystem. The five subsystem relics can be unearthed in deadly magnetometric archeology sites all throughout Sleeper space. Hull sections can be recovered from the wrecks of ancient Talocan ships in Sleeper radar sites. To be able to perform RE you will require a POS with an Experimental Lab (can be anchored in high sec) or access to a Caldari Outpost. You cannot do RE in normal NPC stations. There are 3 different categories of Ancient Relics, these are Intact, malfunctioning and Wrecked. Reverse Engineering, like Invention is based on chance which is affected by skills and by the type of Ancient Relic you are using (intact = best chance and wrecked = worst chance). Racial Hybrid tech Decryptors - determines the race the BPC will be, so if you use a caldari Decryptor then on a successful RE attempt the BPC will be of Caldari design. All items above are consumed by the RE job (it's not like invention where the interface isn't consumed). There are varying degrees of success, if you aren't successful then you may get back a datacores, a decryptor or the hybrid tech and then there's the utter failure where you completely fail and get nothing at all. If you use "intact" relics there's a chance you may get a wrecked relic back from a failed RE attempt. 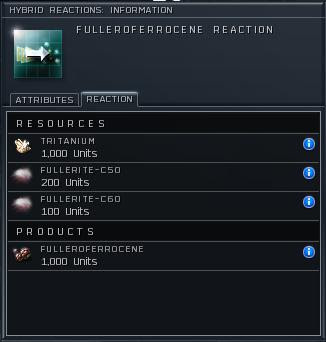 Fullerenes - 9 different types of fullerite gases harvested using a gas harvester module. Ancient Salvaged Materials - salvaged from Sleeper NPC wrecks and T3 ship wrecks. Ancient Relics - found using the Archaeology Analyzer module. Datacores, R.A.M.- Hybrid Technology, [Racial] Hybrid Decryptors - found using the Hacking CodeBreaker module. 1. Harvest fullerite gases from gas cluds in WormHole/Sleeper (WH) space. 2. Polymer Creation - React the Fullerene gases in a POS Polymer Reactor Array to create Hybrid Polymers. 3. Salvage Sleeper NPCs and T3 ship wrecks for Ancient Salvaged Materials. 4. Using T3 Hybrid Component Blueprints available from the market under Blueprints / Components / Hybrid Components, manufacture T3 Subsystem Components from Hybrid Polymers + Ancient Salvaged Materials. 5. Reverse Engineering: - Ancient Relics are Reverse Engineered (RE) using a POS Experimental Laboratory (or Caldari Research Outpost) to produce T3 Hull BPCs and T3 Subsystem BPCs. 6. T3 Ship Hull & Subsystem manufacture at a POS Subsystem Assembly Array (or Amarr Factory Outpost) using the reverse engineered T3 Hull/Subsystem BPC and T3 Subsystem Components. Over the past few weeks I've been recapturing my misspent youth by engaging in my all time favourite past-time. 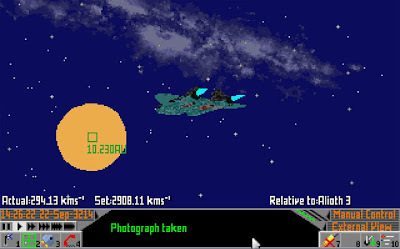 Frontier: Elite 2 consumed vast chunks of my childhood, it's probably why I'm so antisocial today. Re-acquainting myself revived my passion for David Brabens' work. Lately Frontier Developments have concentrated on games such as Roller-Coaster Tycoon and Wallace and Grommit which don't appeal to me, but their next project; The Outsider is a marked diversion from their current portfolio and should herald in the development of the holy grail; Elite 4. After spending many, many hours exploring the (apparently) accurate star systems, I witnessed the immense scale of some of the stranger solar formations; a star containing the mass of 800,000,000 times our own planet, dominating the sky from a distance of 10AU (1.5 billion kilometres). I have come to realise that Frontier is simply a staggering achievement even by today's standards. Getting Frontier to work in a modern POD can be problematic, but fortunately there is a share-ware hack program called Dos-Box, which emulates ancient alien operating systems enabling one to install and revive classics. Forgive the lack of a visual feast on show and imagine what grandeur would be present if Frontier were developed today. It would be simply staggering. As yet details on Elite 4 are extremely scarce and David Braben is reluctant to divulge. After 20 or so years of waiting, I'm almost ready to chew off my own arm. But I'm used to waiting, so I will damn-it. David Bowie is an institution. I've enjoyed the pleasure of his music for the last twenty years and although Mr Bowie does, his music never grows old. So please enjoy one of his more famous songs from 1969; Space Oddity.